PETER MARTIN WOMAN beautiful blue sweater jacket, Plus size 3X. Bust-pit to pit: 23.5".Sleeves: 25".Full length: 29". Width at hem edge across front 25". Sleeve openings have adjustable Velcro for wrists. Toggle clamp, adjustable waistband. Hidden hood rolled up in collar. Mint green torrid blazer. Lined. Very nice. Wardrobe looking a little passe?. Get back in the stylish swing of things with this cute, cropped jacket. Five bold, leather buttons line the front placket and lead up to a mod mock neckline. From Dialogue(R) Fashions. IMAN Women’s Leather Jacket Size 3X Excellent condition! Shipped with USPS Priority Mail. It has a gray and red plaid attached scarf that could easily be removed if not wanted. There are 2 front pockets one on each side. The coat is fully lined with a satin like fabric. BE Ready for next winter ! Sumptuous waffle knit and shiny studs shake up your more staid sweats. From Quacker Factory. Features:hoodie, two functional front pockets, long sleeves. Hardware:stud detail on front, zip-front closure. Plus Size RBX Black/Gray Jacket Size 3X. Condition is Pre-owned. Shipped with USPS Priority Mail. When the weather is cool, you'll fall for this adorable, long-sleeved knit jacket. Its shawl collar and button-front closure lend cute detail to the cozy piece. From Denim & Co.(R) Fashions. Denim & Co. TORRID SIZE 3 (2X/3X). Draped open front. Stretch, knit, 100% rayon. BLACK LACE TRIM VEST/cardigan. Junior size are for teens & run 2 sizes smaller than woman's. comfortable stretch, unless noted otherwise. 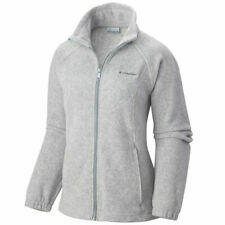 Womens Columbia Jacket 3x . Condition is Pre-owned. Colors: brown, winter white and aqua Measurements: Shoulder to wrist 30” Shoulder to hem 27” Chest 30” Does not have the inner fleece lining. Comes from a smoke free home. Shipped with USPS Priority Mail. No returns. No international shipping. Size: 3X but runs more like 2X. Level Eight Jacket. Double Breasted Front. Color: Black. womans white bomber jacket. Condition is New with tags. Shipped with USPS Priority Mail Flat Rate Envelope. Fastener: Open. 100% Polyester with Polyurethane coaching and faux suede backing. Sleeve Length: Sleeveless. Smooth to the touch.Suede and slick leather feel. Item does not have shoulder pads. Style: Blazer Jacket. Length (Top of Collar to Hem): 32 ". They will help us improve our service. 100 % Polyester lining (white), 100 % Nylon Shell with waterproof coating. Machine wash cold, tumble dry low. 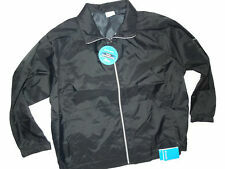 CHICO'S Black Jacket. Chicos Size 4. Modern look with flared sleeves. The coat is warm thinsulate fabric. This coat is in a striking Christmas red. Very light weight to wear over sleeveless type of apparel. Torrid black pinstripe vest, size 3. Like new!!! 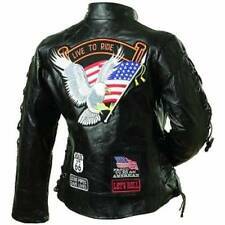 Bob Mackey light weight jacket. dark brown with lighter brown trim. with gold and light brown. machine washable. front zipper. Haik's Denim Vest. Body Length(Bottom of collar, going down the back to bottom of shirt): 24". I try to upload only photos that provide an accurate representation of product colors but variations in monitors( or phone) and monitor (or phone) settings may alter the appearance of those colors.